Pokémon Channel is the spiritual successor of Hey You, Pikachu! released on GameCube, mainly to promote the Nintendo e-Reader accessory. It is a cross genre game since it combines the simulation, digital pet and adventure genres. 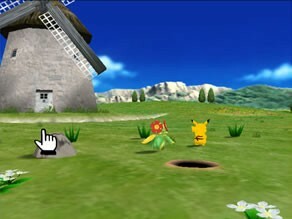 The game revolves primarily around helping Professor Oak with his Pokémon TV Programs by watching the TV channels with Pikachu and exploring some featured areas of Mintale Town, all while interacting with the Pokémon present in there. Compared to its predecessor, the graphics have hugely improved, with more detailed 3D environment, Pokémon models and animations. The sound has also progressed compared to Hey You, Pikachu! with the Pokémon actually saying their names, just like in the anime series, along with the introduction of several new music themes. The game makes use of an in-game clock system that tracks real time, making a day of in the game last as much as one in real life. Eventually, finishing the game requires a whole week, as it asks the player to return tomorrow, each time, to unlock a new TV Channel and a new task. The game starts out with Professor Oak sending the player a TV set, transported by a Magnemite group. Upon turning it on, Professor Oak appears on the screen and asks the player for help. It seems he's developing TV Channels for Pokémon trainers and their Pokémon, with a variety of enjoyable programs. He requires that the player watches the programs and reports on the Report Channel. The first program the player is asked to watch is Pichu Bros. in Party Panic. After watching the animation and reporting as requested, some strange sounds are heard outside. 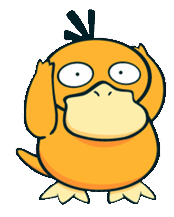 The player investigates them and finds a Pikachu, a Mudkip, a Treecko and Torchic. The Pokémon run away when the player appears, except Pikachu that decides to enter the player's room. 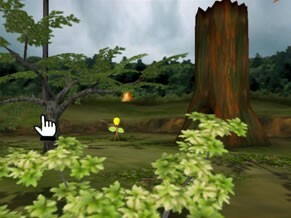 Professor Oak expresses his fascination with Pikachu's curiosity and asks the player to take care of it, making it the second tester for his TV Channels. The player can choose now to go outside and do a few tasks. Different Pokémon can be found in the surrounding areas, depending on what time it is. Moreover, successfully interacting with the Pokémon, by giving the correct answers to their questions, would reward Pikachu and the player Nice Cards. 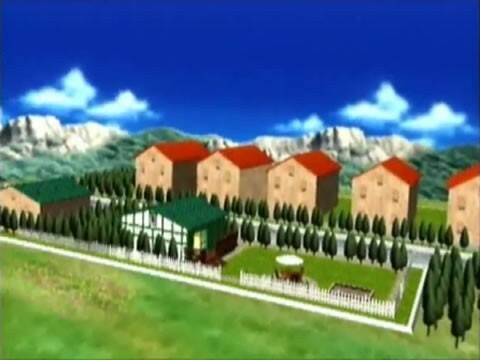 If the player leaves through the backdoor, they'll go to the backyard of the house where they'll notice a close by area called Springleaf Field, which they can visit with Pikachu. The Springleaf Field is decorated with clovers, windmills and containing a strange hole. 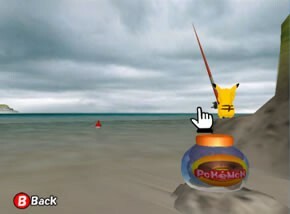 Upon investigating the hole Pikachu will find a Beach Ball and use it to play around. As for going out from the front door, it will take the player to the Bus Station, via which they can visit several locations. After leaving and returning inside, Professor Oak will notice how well Pikachu was acting. Pikachu gets too excited and electrifies the TV set. Professor Oak makes Magnemite deliver a Retro TV to the player's house that they will use, until the modern one is fixed. On the Retro TV set, all shows are displayed in black and white. On day two, the new TV is delivered, as promised and Professor Oak announces that the Channels are getting popular. Pichu Bros. Part 2, Slowpoke's Weather Report, Smeargle's Art Study are the new unlocked programs. The Viridian will be on sale on Shop n'Squirtle along with a new mini game. 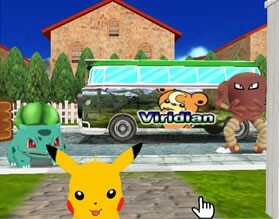 Buying the pass, allows the use of the Bus Station to travel to the Viridian Forest, on the next day, where Pikachu can join a funny concert or eat the different Mushrooms available at the location. After watching the TV Channels, the player can decide what to do for the rest of the day, including just saving and waiting for the next day. On day three, Pichu Bros. Part 3, Eggzamination and Chansey's Fortune programs are unlocked. Shop n'Squirtle will be selling the Cobalt Pass, which allows the player to visit the Cobalt Coast throught the Bus Station. Delibird will deliver the Viridian pass, the player ordered the day before, along with the other stuff he ordered on this day. Visiting the Cobalt Coast lets Pikachu enjoy a lot of fun activities like interacting with other Pokémon, playing Tic-Tac-Toe or even fishing. On day four, Pichu Bros. Part 4, Odd One Out, Mareep Farm and Chum Chum Ranking programs are available. Shop n'Squirtle will be putting the Snowfall Pass on sale. 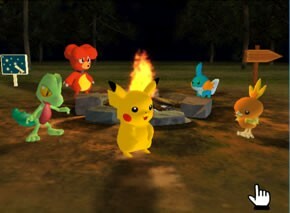 Pikachu seems to have invited some of his Pokémon friends to hangout at the player's house. 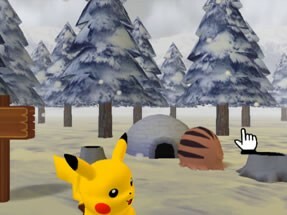 Pikachu and the player can visit Mt. Snowfall after buying the pass. Few enjoyable activities can be done there, as watching a Pokémon Concert and building snowmen. On day Five, Pichu Bros. Part 5 doesn't get aired. Upon watching Pokémon New Flash, the player learns that the Magnemite transporting the Pitchu Bros Part 5 episode's disc dropped it somewhere in Mt. Snowfall. Both Pikachu and the player head to Mt. Snowfall, after obtaining a lamp from a Duskull they ecnounter. 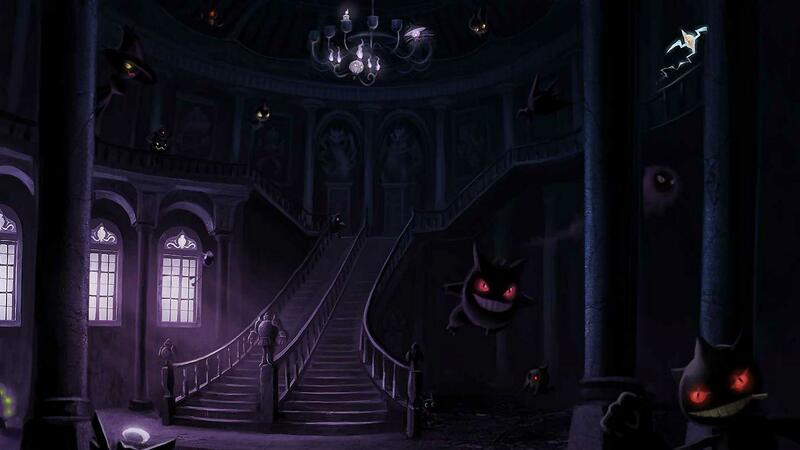 There, they discover the Ruins Of Truth guarded by a Gengar, that will be scared away by the lamp. 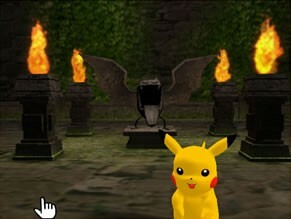 Within the ruins, Pikachu can use ThunderShock on some strange flowers to illuminate the area. A Golbat statue is then found and Pikachu tries to look inside it but gets stuck. 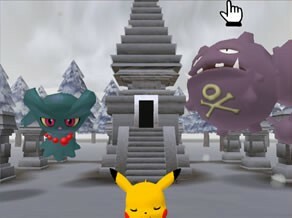 Once the player gets Pikachu out of the statue, it will have the lost episode's disc with it that can be delivered to the Magnemite waiting in front of the ruins. Once the mission completed, they can return home to watch the episode and Meowth's Party. On day six, Professor Oaks announces that all the programs were successfully aired and thanks both the player and Pikachu for their help. He also states he has a gift for them, that is a Start Projector that can project images into the sky. 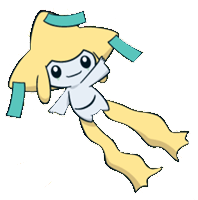 At night, a Jirachi visits the room and takes the player and Pikachu to Camp Starlight where the Star Projector is located. There, they use it to reflect all the episodes of Pichu Bros series. The credits then come up, as the game is now finished. Pokémon Channel is a TV-broadcasting network that airs a variety of Pokémon programs, and he's selected YOU as the initial test audience! 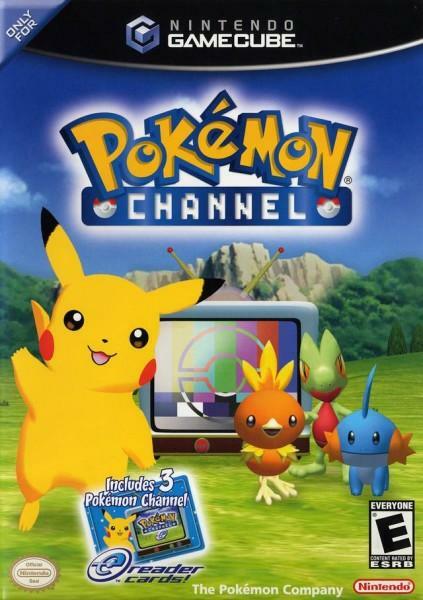 With the help of Pikachu and other Pokémon, you can make Pokémon channel the highest rated channel on TV! 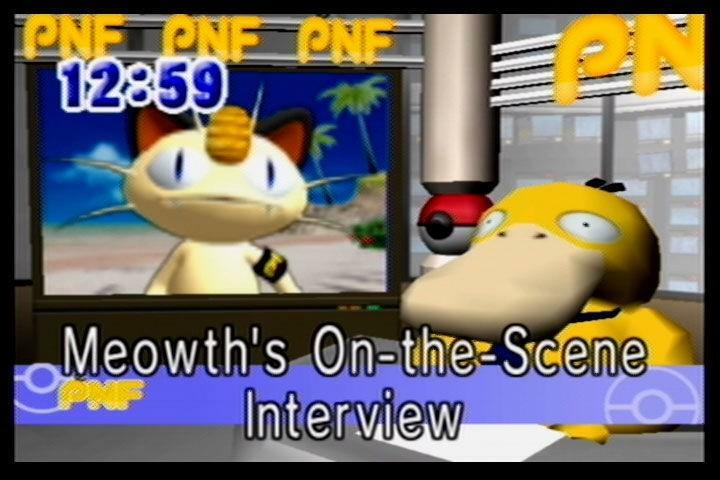 Pokémon News Flash - Watch Psyduck deliver the news while Meowth reports on-location. Pay close attention for hints on where to meet Pokémon. Featuring an all-new animation: Pichu Bros. in Party Panic! exclusively for Pokémon Channel! Smeargle's Art Study - Paint your favorite scenes and have them evaluated by Smeargle! 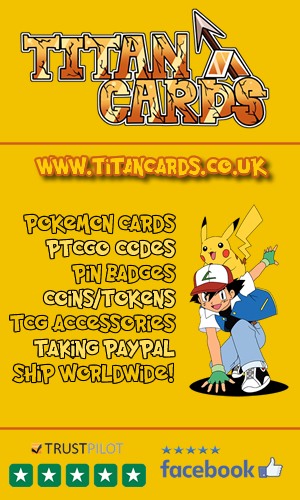 Shop 'N Squirtle - Use purchase points to buy items for your room and make it more Pikachu friendly! Play with Pikachu outside and meet many different Pokémon! Pokémon mini - Play a virtual version of Pokémon mini and select from a variety of mini game titles! The Springleaf Field: A grassy field full of clovers and containing three windmills. The Viridian Forest: A thick forest with many large trees and mushrooms spread everywhere. The Cobalt Coast: A vast beach area. The Mt. Snowfall: A snowy mountain that is also home of the Ruins of Truth. Professor Oak: A very famous Pokémon Professor, featured in most Pokémon games and the anime Series. He studies the relationship between the Pokémon and their trainer. Professor Oak has a Research Lab, in the Kanto region, where he conducts most of his work. In Pokémon Channel, he is starting out his own TV network, featuring a variety of Channels that target Pokémon trainers and their Pokémon, as the main audience. He asks the player and Pikachu to help him testing the channels by watching and reporting about them. The player: One of the inhabitants of Mintale Town, who's the luckily selected first tester for Professor Oak's TV Programs. Throughout the game he befriends Pikachu, with which he watches the TV Network and visit several locations. 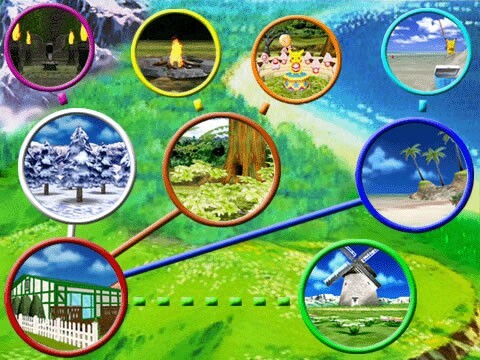 There are different Pokémon encountered during the game, whether at the player's house or in the available locations. What Pokémon the player finds outside, depends on what time of the day it is and the weather. Pikachu can interact with these Pokémon and answer the questions they ask. If it answers correctly, Nice Cards could be rewarded. There are also a lot of Pokémon featured on TV. From left to right: At the bus station, Springleaf Field and Viridian Forest. From left to right: Coral Coast, Secret Cove in the Coral Coast & Mt. Snowfall. From left to right: Ruins of Truth (Exterior), Ruins of Truth (Interior) and Camp Starlight. 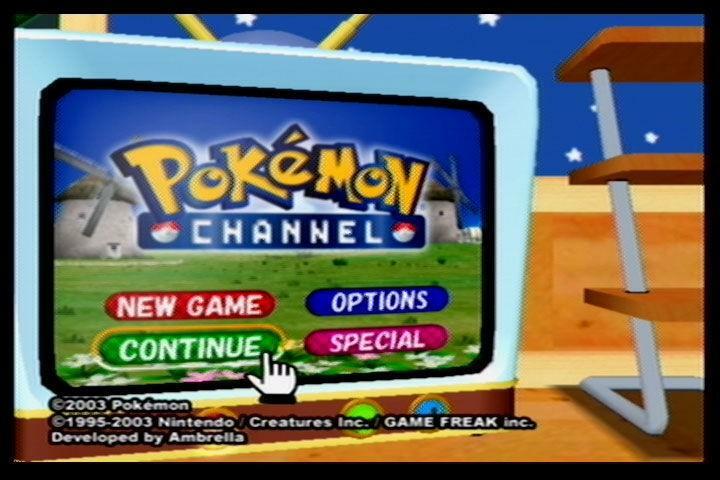 Plenty of Channels are available for the player and Pikachu to browse. Channels are unlocked each day, as the game progresses. The Pichu Brothers: They feature the adventure of the Pichu Brothers with their friends and their quest to get an invitation to Meowth's Party. There are different channels for each episode and one for the full version. There are also channels with foreign language versions of the episodes. Professor Oak Report: Here the player can save the game. 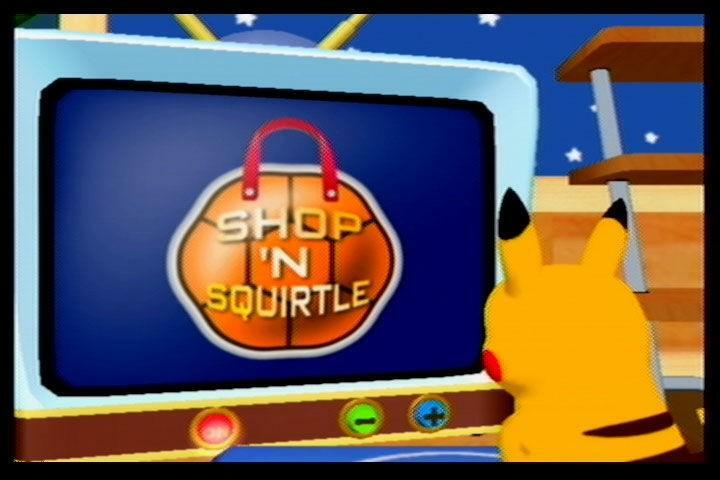 Shop n'Squirtle: A channel that features a shop where a Squirtle named Spencer and wearing glasses is selling a wide range of items. Here the player can buy Nice Cards, mini games, room decorations and bus passes. Items are delivered the next day by Delibird except for the passes that are delivered instantaneously. 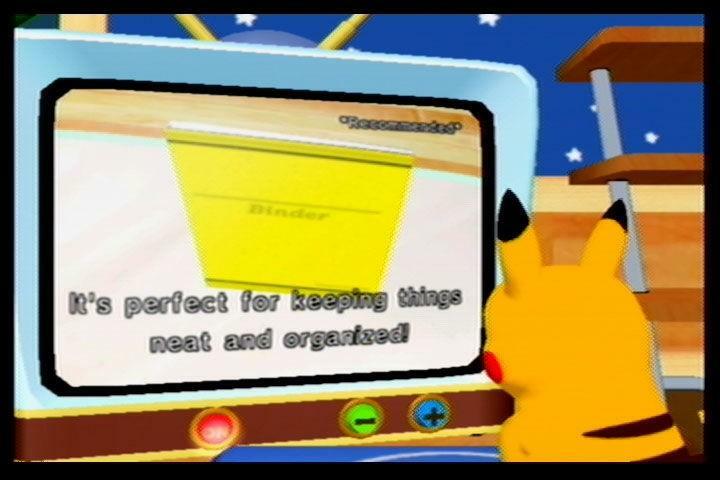 Pikachu strongly considers the purchase of a Binder on the Shop 'N Squirtle shopping channel. Smoochum Shape Up: A fitness program conducted by a Smoochum named Roochu, which is the twin sister of Moochu. Chum Chum Ranking: A channel that announces the top five popular Pokémon or things, introduced by Moochu, twin sister of Roochu. Pokémon are also asked about their favorite two things and the channel does also display different statistics about the player. 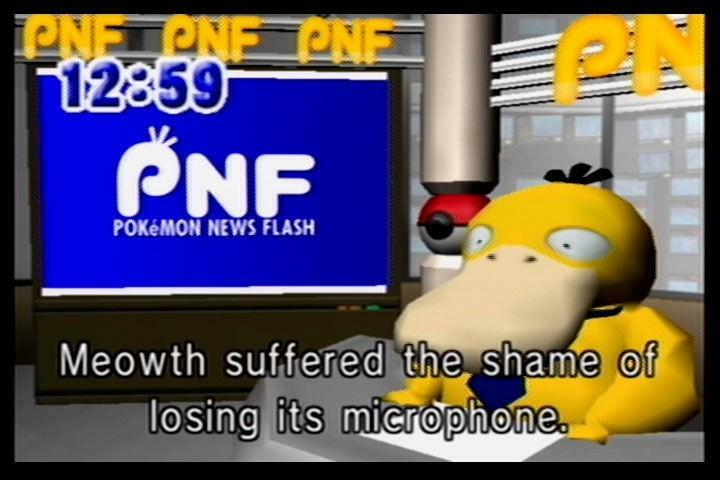 Pokémon News Flash: A news show conducted by Psyduck that reports the current news in the Pokémon world with the help of Meowth that interviews different Pokémon in different areas. Meowth attempted to report live from THE SCENE, but sadly suffered the loss of its microphone at the vital moment. Odd One Out: A channel where the player can bet whether the number of the Oddish that will come on the screen is even or pair. Chansey's Fortune Cookies: A fortune telling channel, hosted by Chansey. Chansey offers five cookies with different messages. One message can be chosen daily. Mareep Farm: A channel where a bunch of Mareep are counted while they're jumping over a fence. Watching them will make Pikachu sleepy. Slowpoke's Weather Report: Slowpoke will be telling the specific weather in one of the regions. The current weather in that region will change to what Slowpoke actually announced. The weather affects the Pokémon available in the different area, which makes this channel very important. 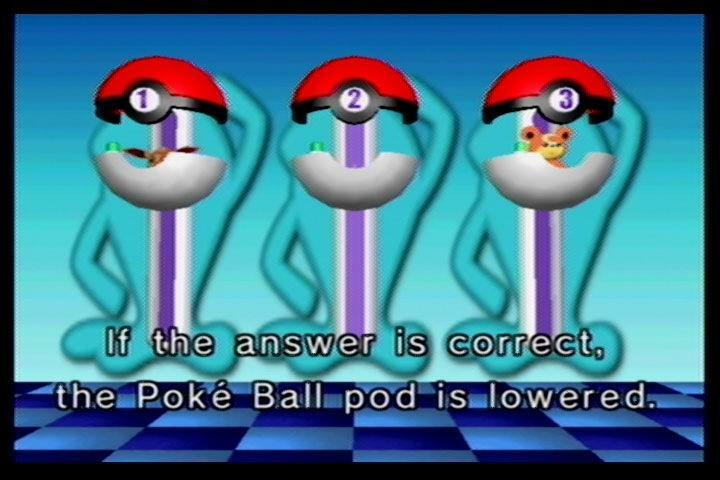 Quiz Wubbuffet: Three Pokémon have to answer the different questions given by Wubbufet, the host of the show. There's a part where the player can participate and earn money. 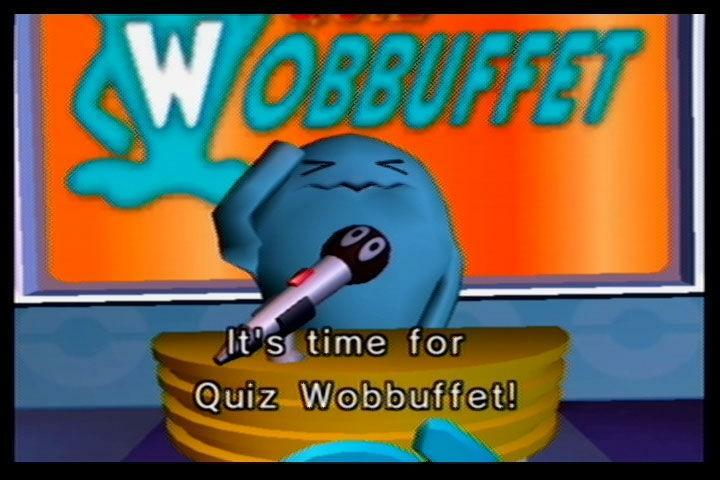 It's that time again folks, it's time for Quiz Wobbuffet! Smeargle's Art Study: A number of pictures are being hanged on the wall and a Smeargle, the host and an artist, will be rating them. Eggzamination Hatch Up: A channel where a Pokémon Egg is displayed and the player would have to guess what Pokémon would come out of it. Guessing the right Pokémon would earn the player Money. The hatching process can take too long, up to a whole day. There will come a time where Pikachu will point under the player's bed. If the player lets it investigate, it will find a console on which Pokémon Mini Games can be played. There's a free mini game called Snorlax's Lunch time, where the player has to feed Snorlax over and over. Other Pokémon Mini Games can be purchased from Shop n'Squirtle. Check out these Pokémon Channel videos including TV Commercials, Trailers and more. The bumpers used on the Pokémon Channels are similar to BBC's ones. All songs featured in Hey You, Pikachu! are present in Pokémon Channel. The screen title music was supposed to be a different one but the developers changed it for unknown reasons. 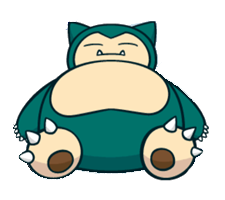 The same music from Snorlax's Lunchtime is used for Snorlax's theme in the Pokémon Zany Cards game. A Pikachu TV can be bought after obtaining all nice cards. The glasses wearing Squirtle, Spencer, is a reference to Ash Ketchum's Squirtle that was also wearing the Squirtle Gang Glasses, from the anime series. Psychic is misspelled as Physic in the English version of the Instruction Manual. Compared to the rest of the Pokémon titles, Pokémon Channel didn't achieve great sales. In fact, the game sales started pretty well, with the game selling over 12,500 copies within three days of its release in Japan. Sales then deteriorated and the game sold an overall of 0.38million copies, which is a small number compared to the other Pokémon Games. Mary Jane Irwin from IGN stated that the intuitive interface of the game and the "mindless entertainment" would actually give the young audience enough fun and entertainment, scoring the game 5/10 which equates to "Mediocre" on IGN's scale. Ricardo Torres of GameSpot thought the gameplay was "Weak" and scored the game 5.4/10 the equivalent of "Mediocre" on the GS scale, while quoting "If you ever thought it would be cool to hang out with Pikachu, think again.". Pokémon Channel still managed to get a good score of 50.55% on GameRankings. 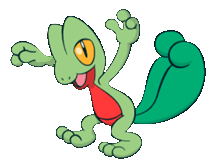 Treecko, one of the cover mons of Pokémon ChannelOverall the game was quite average and didn't realize as much success as it was thought it would.